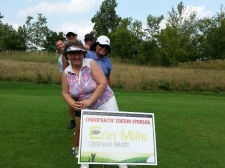 Erin Mills Optimum Health was very happy to sponsor the 11th Annual Community Living Mississauga Golf Classic. It was an excellent opportunity to connect with friends and supporters of CLM. We support CLM and the individuals that it serves through educational programs, events, services, and our time! We find a great amount of pride and personal reward through volunteering and encourage you to do so as well. Volunteering will help create a passion for an event or cause as well as get you excited. All you need in life is something to be excited about!